Stylish outdoor weave armchairs in Brown or Beige weave with a bamboo finish frame. Delivered assembled and ready to use and delivered from stock. Stylish brown and natural weave outdoor bistro arm chairs. Suitable for commercial applications delivered assembled and ready to use. 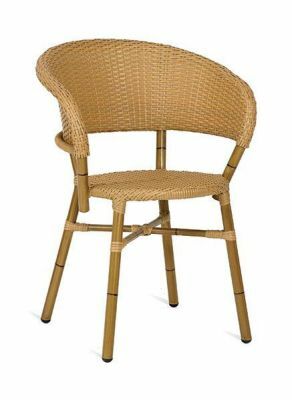 These bistro chairs are held in stock for rapid delivery.